I'm sorry this must be an elementary question. I spent a good deal of time searching through webs including this site for the problem but I got none. 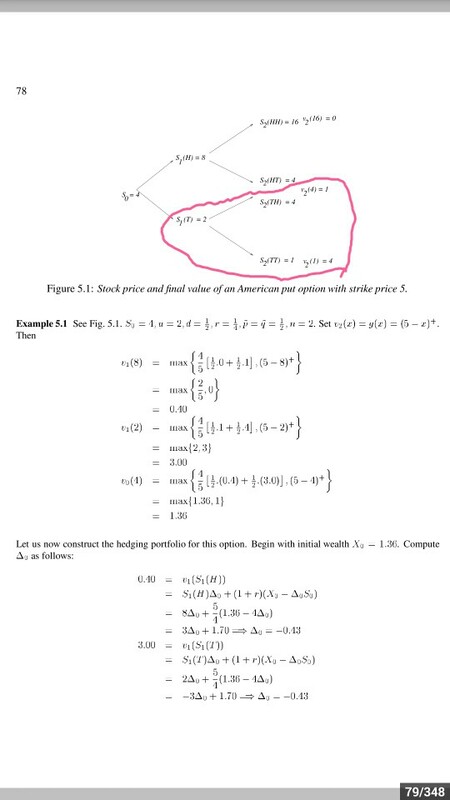 Say we have a binomial tree that is originally(that is, before the put option is introduced) arbitrage-free for sure, and an American put option with strike price K.
Let's assume there's a node (that is not a terminal node) s.t. (1) on that node, the intrinsic value of the put option is greater than its discounted expected value, hence the option is priced at the intrinsic value. (2) on every terminal node(the nodes at the end) that comes out from that node, the option is in the money. And again, at those nodes the price of the option equals the intrinsic value, which is the payoff. Now, if someone makes a portfolio consists of one option and the underlying stock at the node described above, it costs K to set up and its final value is always K, i.e. it is worth K at every terminal node coming from the node. I'm having trouble understanding how this is not an arbitrage opportunity. At and after the node the portfolio is equivalent to zero coupon bond with payoff K and they should be worth the same at the node. However, the bond is worth $K*(1+r)^-t$ whereas the set-up cost of the portfolio is K. An arbitrageur would short the portfolio and lend it to the money market taking risk-free profit. Browse other questions tagged options no-arbitrage-theory binomial american or ask your own question.